Because of the high winter winds in this little town on the eastern coast of the Sea of Cortez, it empties out. This makes for incredibly cheap rental opportunities (cheaper than the worst of the worst Motel 6's (I'm looking at you, Nogales)). Last year, the legendary winds blew so hard that they blew us right out of town. They scared Roo at night and made whatever was wrong with my head worse. We had to leave. So far this year, the wind has hardly blown at all. 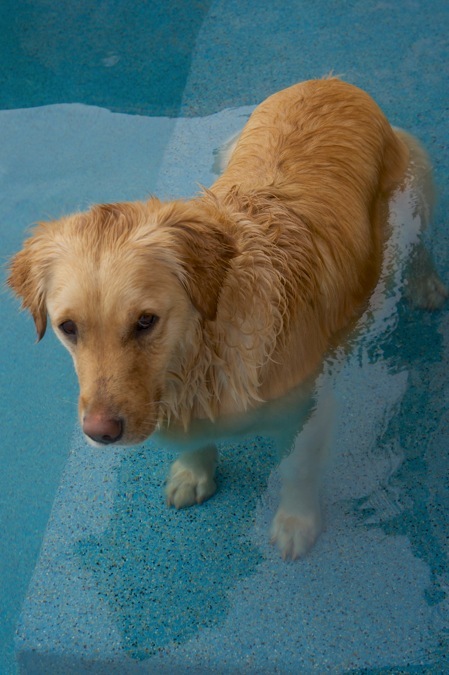 The pool is too cold for human use, but a certain California blonde of our acquaintance thinks it's perfect. As you can see, she prefers it all to herself. That's just about far enough, bud.